First I would like to give credit to the developer of the code that controls all this. Feel free to suggest other colours! Lots of people have been asking me about THRASH ALL THE THINGS build I've been playing recently so I thought I'd throw up my build, gear and info. I personally like Feral Affinity more but the area increase from Balance Affinity will get you more dps through dungeons. The main thing here is getting three thrash relics to increase Jagged Claws trait, here's where to get them. For cooldowns, note that Rage of the Sleeper is 1.5 minutes and Incarnation is 3 minutes. Try and make sure you are using Rage of the Sleeper when it comes up to have it for Incarnation. Join us on Stream, at my house or our event from Mana Bar to help raise funds for our friends Daniel and Laura. Feel free to contact me for more information at TheeTova@gmail.com. Daniel is twenty-six years old, married and living in Winnipeg. While working on his Engineering Degree at the University of Manitoba, he's had a bone marrow transplant and now needs a lung and liver transplant. Breathing shouldn't be difficult. Let's help Daniel breathe easy. Check out the above site for more information on Daniel as well as updates from Laura. 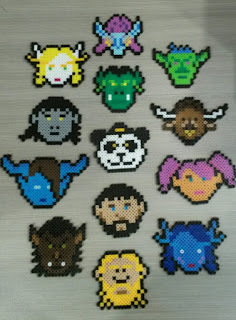 $25 or more - Fused Bead WoW Races! A little overdue but here is Helya. Playing a bear druid, my know my armor and physical damage reduction is quite important. With the 85% physical damage reduction cap, I find myself able to hit this and as a result I need to keep an eye on this not to hit another stack of Iron Fur. 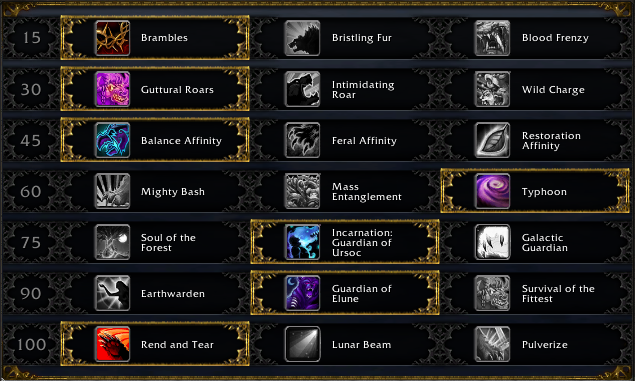 With the lack of much information out there, I thought it would be helpful to put up my armor formulas and WeakAura. This WeakAura will display your current damage reduction based on your current targets level. Or with no target it will display your physical damage reduction based on a 110 mob. Congrats to Vda for winning a weeks game time. Prepare for week 2 - Heroic Gorefiend. Brightpaw Pet - Total Add Damage. Increases chance to dodge by 45% and reduces Physical damage taken by 20% for 6 sec. At first look the 20% decrease physical damage taken look awesome and don't get me wrong, it is nice but after further thought I think it's more of a quality of life change than a huge buff. First of all a vast majority of damage we take as tanks that is physical is dodgable. That being said, on average, this 20% buff only applies to 55% of the damage we take while we have Savage Defense up. Therefore on average when we hit Savage Defense we will only take 11% less physical damage (55% change to be hit * 20% reduction). Therefore in my mind Savage defense is now 56% physical damage reduction. Further to my comment about a quality of life change, say we have a bad Savage Defense and dodge zero attacks. So now instead of our rng dodge we will always take at least 20% less damage. This help with the "getting gib'd" that avoidance tanking can lead to. Here is a chart for an example of a 1.5 melee swing timer mob for one Savage Defense. Total Damage Reduction During A Savage Defense. As we can see this just brings up the bottom end of Savage Defense which was really needed to make bears a more stable tank.